Install Gnome Classic Desktop in Ubuntu - Ubuntu has bring Unity as default desktop. If you just don't like Unity, and prefer to used back gnome classic desktop, this tutorial will explain how to install Gnome classic to your Ubuntu system. By use this guide we'll have 2 view that we can choose, that was Unity or Gnome classic. See the screenshot below for more details / the result of this tutorial. 1. What's Gnome and Unity? GNOME is a desktop environment which is composed entirely of free and open-source software. Its target operating system is Linux, but it is also supported on most derivatives of BSD. GNOME is developed by The GNOME Project, which is composed of both volunteers and paid contributors, the largest corporate contributor being Red Hat. It is an international project that aims to develop software frameworks for the development of software, to program end-user applications based on these frameworks, and to coordinate efforts for internationalization and localization and accessibility of that software. Sources : wikipedia. Unity is a graphical shell for the GNOME desktop environment developed by Canonical Ltd. for its Ubuntu operating system. Unity debuted in the netbook edition of Ubuntu 10.10. It was initially designed to make more efficient use of space given the limited screen size of netbooks, including, for example, a vertical application switcher called the launcher, and a space-saving horizontal multipurpose top menu bar. Unlike GNOME, KDE Software Compilation, Xfce, or LXDE, Unity is not a collection of applications but is designed to use existing programs. Unity is part of the Ayatana project, an initiative to improve the user experience within Ubuntu. In addition to Unity, there are Application Indicators and other projects such as MeMenu, the notification system and the application NotifyOSD gathered. Sources : wikipedia. Type your password when prompted. The progress of installation will displays to your terminal. It's also said how much disk space will be used and a question to confirm continue installation. Type 'y' then press enter. Select the GNOME Flashback option for either Compiz or Metacity. After that, you'll automatically returned to login screen. 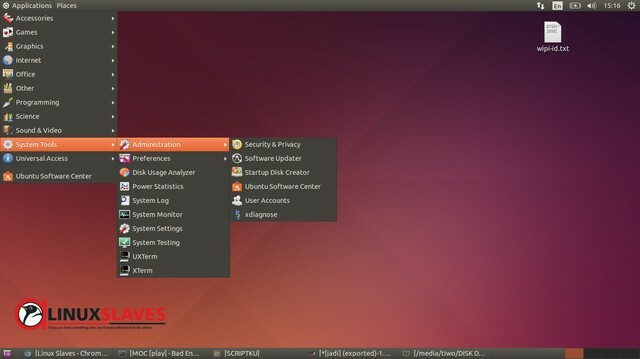 Hope help you which looking for change unity to gnome classic on ubuntu desktop. Thanks for visiting Linux Slaves. I'll update more articles, tutorials or anything about Linux as soon as possible.